KBB.com 10 Most Affordable SUVs. Only 51,200 Miles! This Hyundai Tucson boasts a Regular Unleaded I-4 2.4 L/144 engine powering this Automatic transmission. Variable Intermittent Wipers w/Heated Wiper Park, Trip computer, Transmission: 6-Speed Automatic w/SHIFTRONIC -inc: active ECO system, lock-up torque converter and manual shift mode. 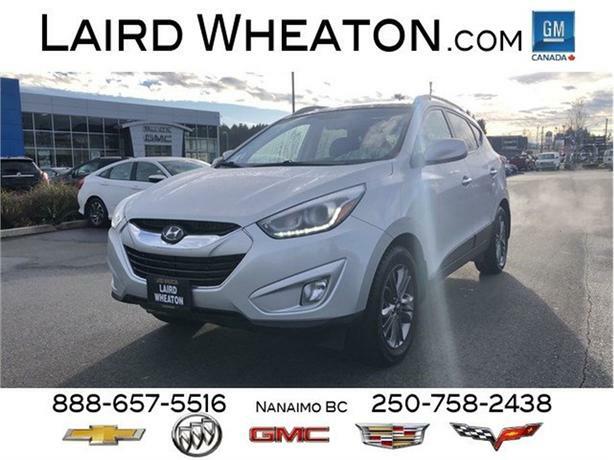 * This Hyundai Tucson Features the Following Options *Transmission w/Driver Selectable Mode and SHIFTRONIC Sequential Shift Control, Tailgate/Rear Door Lock Included w/Power Door Locks, Strut Front Suspension w/Coil Springs, Streaming Audio, Steel Spare Wheel, Single stainless steel exhaust, Side Impact Beams, Roof Rack Rails Only, Remote Releases -Inc: Mechanical Fuel, Remote Keyless Entry w/Illuminated Entry and Panic Button. * Stop By Today *Test drive this must-see, must-drive, must-own beauty today at Laird Wheaton, 2590 Bowen Road, Nanaimo, BC V9T 3L3.